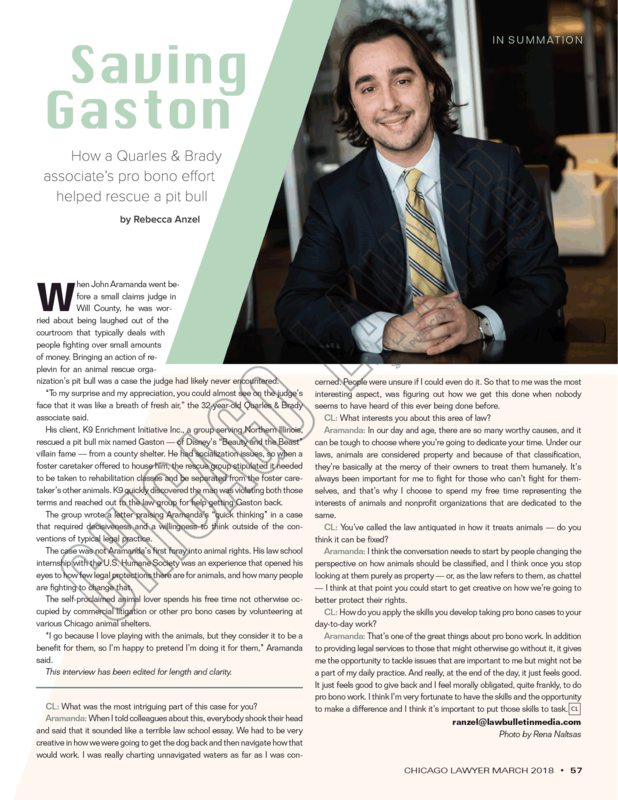 Chicago Lawyer Magazine published this piece in print in March 2018. When John Aramanda went before a small claims judge in Will County, he was worried about being laughed out of the courtroom that typically deals with people fighting over small amounts of money. Bringing an action of replevin for an animal rescue organization’s pit bull was a case the judge had likely never encountered. “To my surprise and my appreciation, you could almost see on the judge’s face that it was like a breath of fresh air,” the 32-year-old Quarles & Brady associate said. His client, K9 Enrichment Initiative Inc., a group serving Northern Illinois, rescued a pit bull mix named Gaston — of Disney’s “Beauty and the Beast” villain fame — from a county shelter. He had socialization issues, so when a foster caretaker offered to house him, the rescue group stipulated it needed to be taken to rehabilitation classes and be separated from the foster caretaker’s other animals. K9 quickly discovered the man was violating both those terms and reached out to the law group for help getting Gaston back. The group wrote a letter praising Aramanda’s “quick thinking” in a case that required decisiveness and a willingness to think outside of the conventions of typical legal practice. The case was not Aramanda’s first foray into animal rights. His law school internship with the U.S. Humane Society was an experience that opened his eyes to how few legal protections there are for animals, and how many people are fighting to change that. The self-proclaimed animal lover spends his free time not otherwise occupied by commercial litigation or other pro bono cases by volunteering at various Chicago animal shelters. “I go because I love playing with the animals, but they consider it to be a benefit for them, so I’m happy to pretend I’m doing it for them,” Aramanda said. CL: What was the most intriguing part of this case for you? Aramanda: When I told colleagues about this, everybody shook their head and said that it sounded like a terrible law school essay. We had to be very creative in how we were going to get the dog back and then navigate how that would work. I was really charting unnavigated waters as far as I was concerned. People were unsure if I could even do it. So that to me was the most interesting aspect, was figuring out how we get this done when nobody seems to have heard of this ever being done before. CL: What interests you about this area of law? Aramanda: In our day and age, there are so many worthy causes, and it can be tough to choose where you’re going to dedicate your time. Under our laws, animals are considered property and because of that classification, they’re basically at the mercy of their owners to treat them humanely. It’s always been important for me to fight for those who can’t fight for themselves, and that’s why I choose to spend my free time representing the interests of animals and nonprofit organizations that are dedicated to the same. CL: You’ve called the law antiquated in how it treats animals — do you think it can be fixed? Aramanda: I think the conversation needs to start by people changing the perspective on how animals should be classified, and I think once you stop looking at them purely as property — or, as the law refers to them, as chattel — I think at that point you could start to get creative on how we’re going to better protect their rights. CL: How do you apply the skills you develop taking pro bono cases to your day-to-day work? Aramanda: That’s one of the great things about pro bono work. In addition to providing legal services to those that might otherwise go without it, it gives me the opportunity to tackle issues that are important to me but might not be a part of my daily practice. And really, at the end of the day, it just feels good. It just feels good to give back and I feel morally obligated, quite frankly, to do pro bono work. I think I’m very fortunate to have the skills and the opportunity to make a difference and I think it’s important to put those skills to task. Chicago Lawyer Magazine originally published this piece online here.